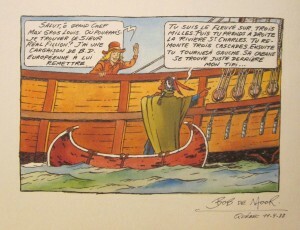 In 2013 the second volume in the El Spectro series by graphic artist Yves Rodier and storywriter Frédéric Antoine was published: “Trans-Amazonie”. So what does that have to do with Bob De Moor you may think. We all know that Yves Rodier is a huge Bob De Moor fan (if you don’t, then you should check out this interview we had with Yves Rodier on the matter), so it wasn’t really a surprise that Bob De Moor also showed up in the album… as a mechanic called Salvatore! 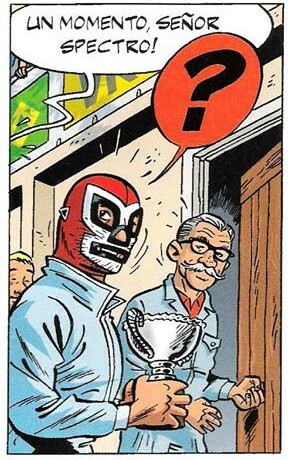 The image we show you today comes from issue 26 of the comic magazine L’Immanquable in which the second El Spectro album “Trans-Amazonia” saw a pre-publication. It was kindly sent to us by Alain Demaret. If you want to have that album in your collection, know that the El Spectro albums can still be ordered via Amazon . 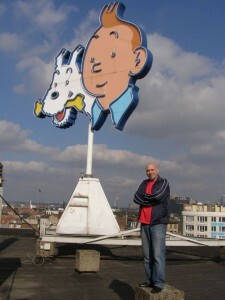 Yves Rodier on the roof of the Le Lombard building in Brussels. Yves Rodier (born 5 June 1967) is a Franco-Quebec comic strip author who got widely known for having completed “Tintin and Alph-Art“, albeit in a non-official version of course. It never got commercially released but despite that, it must be one of the most pirated unofficial albums ever. 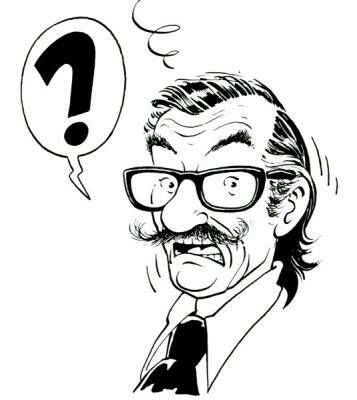 Since then, he has continued to make Tintin pastiches (although he has always kept in the spirit of Hergé unlike most other pastiches out there), he worked in animation (Marsupilami, Heavy Metal:FAKK 2, Bob Morane, Papyrus, Fantômette), but also built a successful comic career with his own series “Pignouf et Hamlet“, “Aventures de Simon Nian” and more recently “El Spectro” (check the official Facebook page). The latter is released via Le Lombard. We contacted Yves Rodier to ask him if he could tell us a bit more about how he met Bob De Moor. 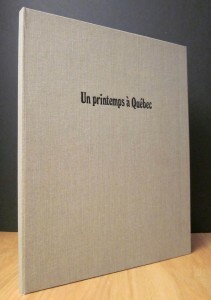 In 1988 the Canadian Québec based publisher Réal Fillion issued a book “Un printemps à Québec” holding a portfolio of 14 drawings in color by some of the most famous comic artist from that time. The portfolio we talk about here was published on the occasion of the 1st ‘Festival de la BD francophone de Québec’ (FBDFQ) held in April 1988. Réal Fillion was also the organizer of said festival. Released on only 390 copies the “Un printemps à Québec” book is a hard to find item which however pops up on eBay every now and then. Note for the Belgian readers : at the CBBD in Brussels they also have a copy in the library which you can scrutinize. The library is a place that is full of treasures for Bob de Moor fans actually. So you know what to do the next time you are in Brussels. In the book you’ll find illustrations by the following comic artists: François Craenhals, Bob de Moor, Zoran, Antonio Cossu, Jean Morin, Mario Malouin, Martine Boutin and Johan de Moor. On the left you can see the drawing that Bob de Moor made in Québec on April 11, 1988. You can see Cori asking the direction to Réal Fillion where he has to drop a packet of European comics. 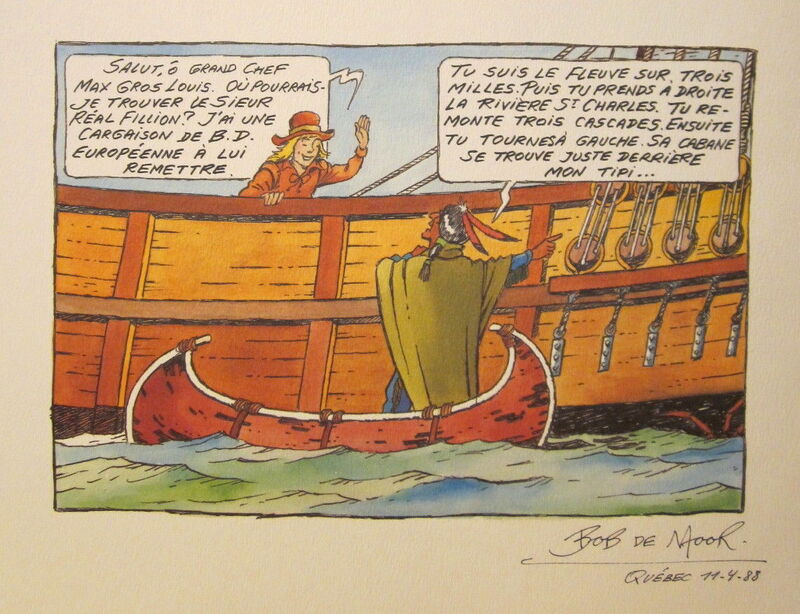 Note that one of the Québec comic artists who have since appeared there was Yves Rodier… does it ring a bell? More on Rodier and his encounter with Bob de Moor in the next days.